What Actually Causes American Fear of Islam and Muslims? 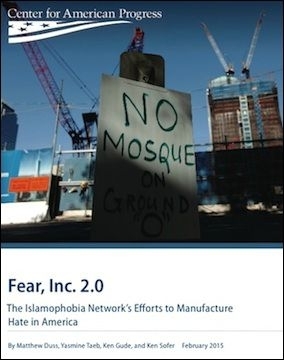 An ambitious 81-page document, Fear, Inc. 2.0: The Islamophobia Network's Efforts to Manufacture Hate in America, just appeared from the Center for American Progress, a liberal Democratic organization. Unlike its first iteration, in which a group with a $40-million annual budget and deep ties to big business had the nerve to claim that seven much smaller institutions were overpowering the country through their financial clout, this one looks at what the alleged "Islamophobia network" actually does. The report, written by Matthew Duss, Yasmine Taeb, Ken Gude, and Ken Sofer, makes for interesting reading. Its premise is that critics of Islamism (1) are really anti-Islamic and (2) have single-handedly distorted a the fundamental American value, namely a "basic respect for the rights of minority groups throughout the country." According to the CAP study, "the views of anti-Muslim actors stand in stark contrast to the values of most Americans." A group with a $40-million annual budget has the nerve to claim that seven much smaller institutions are overpowering the country through their financial clout. By dint of hard work, however, "a well-funded, well-organized fringe movement can push discriminatory policies against a segment of American society by intentionally spreading lies while taking advantage of moments of public anxiety and fear." This effort "takes many shapes and forms": a general climate, cynical political efforts, and institutional policies. Despite some setbacks, continues the CAP narrative, the network's efforts "continue to erode America's core values of religious pluralism, civil rights, and social inclusion." Those fingered as part of this network (I am one) should be perversely proud of our accomplishment: Just a handful of lying individuals manage to subvert a core American value – and all this with what CAP itself estimated to be less than $5 million a year! But there is a more convincing reason why Americans fear Islam and Muslims. The news is filled almost daily and even several times daily with bulletins from one Islamist front or another. I hardly need rehearse the repertoire; just turn to the day's headlines. ISIS and the Charlie Hebdo-like massacre most dominate the news, but Islamists are all the time winning unfavorable attention for themselves by making aggressive cultural demands (say, wearing a face-covering burqa in the courtroom), pushing the superiority of Islam (don't dare say a negative word about Muhammad), or apologizing for some repulsive practice (such as honor killings or female genital mutilation). Another way of putting it: the United States hosts about as many Buddhists and Hindus combined as it does Muslims. Yet, when did Buddhists or Hindus try to change the existing order or engage in violence on behalf of their faiths? Who ever hears about them? Who fears them? Maybe it's Islamists who are prompting powerful and spontaneous responses through their threatening behavior. Maybe we critics are not "intentionally spreading lies" but honestly interpreting Islamist aggression and supremacism. Maybe CAP and its ilk should blame the fear of Islam less on us critics and more on the Islamists themselves. Related Topics: Islam, Muslims in the United States | Daniel Pipes receive the latest by email: subscribe to the free mef mailing list This text may be reposted or forwarded so long as it is presented as an integral whole with complete and accurate information provided about its author, date, place of publication, and original URL.